Cover art for Electroacoustic Works. Photo credit: Dan Joseph. Who’s Afraid of Electroacoustic Music? prevails as the industry response to electronic-oriented works within the classical music world. When used as a tool by the daily consumer, technology stands unquestioned; but when used as a compositional method by the daring composer, straying wide of what occurs merely on the page—ruled solely by sheet music—technology remains uncharted. Dan Joseph’s latest album, Electroacoustic Works, compiles several post-minimalist chamber works exploring differing relationships with technology and time. If computer improvisation does not trigger one’s trembling reflex, a long-form drone piece gleaned from a six-hour installation—questioning perceptions of temporality—just might. Fortunately, Electroacoustic Works is far from rowdy and reckless, imbued with a thoughtful austerity never eschewing beauty. Dan Joseph is more than a label comprised of two first names; more than three syllables weighted to sound like a secret explicative. Dan Joseph makes music—has made music for over 30 years now. For a composer residing in Brooklyn, New York, there is nothing explicitly metropolitan about Joseph’s music; it defies the motoric madness called home by bleary-eyed taxi drivers reeking of smoke. Instead, Joseph’s chamber compositions mirror his own name, a modest surface concealing subtle science: effervescent as mid-summer’s mixed drinks. Tapped with the same hands which once pounded drum heads in rock bands, Joseph’s post-minimalist constructions charm with a levity both casual and sublime, curious as the hammered dulcimer with which he composes. Composing primarily for small chamber ensembles, his musical upbringing equally defies any classical pedigree. Involved heavily in the D.C. Punk Scene during the 1980’s, Joseph joined 9353 as a drummer at the age of 16. After the dissolution of the rather volatile group, Joseph circulated freely in the local scene, conspiring next with the neo-psychedelic troubadours Crippled Pilgrims, finally serving as a guitarist for the moody, post-punk band Troubled Gardens. Immersion in the underground cassette scene followed, from which he eventually emerged with several ambient-industrial releases: crepuscular guitar tones dragged through tar, flecked with shortwave radio static, then wrapped around tape heads dripping with torpor. He concluded the electro-acoustic soliloquies in 1991 upon commencing his music studies at California Institute of the Arts. Cover art for Archaea, released 2006. Although having since retired the angst and the languor of his formative years, Joseph’s post-minimalist compositions continue to channel its composer’s dissonant background, now enriched with a new refinement. Archaea, the paragon of Joseph’s early seasoned sound, shines brightly in spires high above clouds. Its three extended chamber works feel lighter than feathers and spacious enough to crawl into: the dulcimer sparkles; the cello sighs; and the clarinet melds warmly with the violin. Rhythmically regal with a slight air of the royal courts, Tonalization (For the Afterlife) explores dramatic dynamics for several smaller ensembles, at times wandering through fields of daisies with wide-eyed optimism; at other times slowing to a crawl—distilled to a ghostly sliver thin as gas but bright as silver. In contrast, Guided By Sound absconds into hazy New Age, adorning Joseph’s lean lines with Andrea William’s humid field recordings. The bed-ready nocturnes tinkle, hoot, bark, and plop—featuring chimes, trains, a neighbor’s dog, and rain on a rooftop. Unfolding like a three act play with a rotating cast between curtain drops, Joseph’s compositions express a sober linearity without resort to refrains. Although employing a similar sense of scale as his minimalist predecessors, Joseph does not daze with La Monte Young’s gnarled mysticisms, or gush with the saccharine effluence of Phillip Glass. Joseph is further distinguished from his post-minimalist peers inclined towards extravagance, between music one could dub mini-mall (heavy on mood and sleek in texture—i.e., pleasant fodder for distracted mall shoppers), and mini-maul (relentless pummeling oblivious to restraint). Avoiding excesses, Joseph surveys the truly mini-mal, a species well-studied, yet rare as the white rhinoceros. Nowhere is Joseph’s devotion to the mini-mal more radical than his latest album. Collecting separate works spanning a decade, Electroacoustic Works coheres together naturally despite drastic shifts in composition methods. “The Set of Four” utilizes a computer-based processing system of Joseph’s own devising, building melodic weight through a soft suite of multi-tracked layers. Purring, pinging, and pulsing through syrupy atmospheres, the dulcimer induces verticality, enticing the ear inward and upward. In contrast, “Dulcimer Flight (El)” and “Dulcimer Flight (Corvalis)” tilt the axis of time along a horizontal plane, traversing cracked mud horizons with glacial raga rhythms. As an open-ended solo piece, each improvisation transforms themes Joseph has recycled since 1998. Sharing qualities both earthy and sweet, every iteration is fermented from a common starter culture—much like Kombucha tea—leaving a hint of sugar mingling with a vinegar twang. Electroacoustic Works’ conceptual Trojan horse, “Periodicity Piece #6”, questions timekeeping itself as a phenomenological practice. The album is assembled from a collage of contrasting sources—high and low cultures, synthetic and organic timbres, Eastern and Western traditions. A Javanese metallophone rings beside click tracks; a tuning fork tangles with sine waves; gunshots from a Western movie punctuate tranquil tones from a chamber ensemble. The hour-long study unfolds with clinical patience, layered melodies looped in succession, building towards a long-form drone guided by an elegant algorithm. Yet the seemingly math-minded composer is not a counter of beans as much as a be-ing counter ever faithful to his metaphysical timekeeping. If timekeeping were housekeeping, Joseph would keep a spotless house. True to his background, the vestiges of rock still slink through the skeletal structures of Joseph’s chamber compositions, creating a backdrop onto which the listener can purge the vexing nettles of their day. Though rock music provokes the status quo through voltage and vigor, Joseph dares conventions through duration and scale. Electroacoustic Works spins music so sheer that a sigh might tear it asunder: don’t move; don’t blink; don’t breathe. Leaving one’s brain tingling with the tangles of tranquil splendor, Joseph’s work worms into the right-brain via a stage left entrance, raised by precisely the major key elation advised for treating one’s seasonal affective disorder: illumination via musical photo therapy. Much like the dulcimer, his signature instrument, Joseph’s art fits no easy square, requiring a fifth side to measure it, to dwell in and abide by. Evolving from a punk culture where society is a dirty four letter word on par with man’s baser body functions, to dark ambient cassette drones intended for solitary midnight vigils, Joseph now creates ether-esque chamber compositions sprinkled with pollen and pixie dust. The mini-mal never sounded so aptly titled, so engaging yet subversive in the hands of a Brooklyn-based sonic décollagist. May Dan Joseph forever refrain from industry tropes, never yielding a side for any four-cornered sound. New York City seems to feature prominently in your online footprint; besides gracing the cover for Electroacoustic Works, your street photography appears frequently in your Flickr and Instagram accounts. Whether owing to its people, music scene, or dynamic weather, you seem to have embraced the New York City whole-heartedly, from gutter grime to searing skylines, from snow filled streets to poster-covered walls. How does the raw vitality of one of the world’s densest metropolises influence your work? What role does the surrounding environment have in your life and in your art? Dan Joseph peruses the shelves in one of his local record stores, Greenpoint, Brooklyn, 2016. Photo credit: Claudia Joseph. New York City is of course a stimulating place, and while I’m not quite sure how this plays out in my music, the city certainly plays an enormous role in my day to day life. Foremost, New York is still a great music city, despite economic changes that are eroding cultural communities, and I certainly take advantage as much as I can of the abundant music the city offers. Beyond music, there is a great deal of other cultural and intellectual activity everywhere—visual art, literature, politics, to name a few—all of which effect my life. And, as you note in your question, the physical environment is a big interest of mine, both the city’s architecture as well as its natural aspects, which are generally under-appreciated. While I am foremost a musician, I’ve always had a strong visual sense and have been a practicing photographer since I was a kid; New York is certainly a great place to take pictures and make videos. Besides composing music, you write album and concert reviews for The Brooklyn Rail, and curate concert programs for both the Musical Ecologies series and the Music for Contemplation series—questioning our relationship to alternative musical movements or practices such as Deep Listening and Wandelweiser. Explain the importance of these non-composing experiences for you as a musician, music fan, and New York City denizen. Do you feel some compulsion to document the goings-on within your community or within your music scene? A Musical Ecologies conversation with David Grubbs in Park Slope, Brooklyn, 2017. Photo credit: Claudia Joseph. As a self-described music obsessive, these non-composing activities are important ways to nurture my interest/obsession. Writing is a great way to focus on and clarify what interests me in a particular artist or group, and also helps to deepen my appreciation of their music. My concert curating and radio programming play similar roles. The Musical Ecologies Series is a monthly concert series I produce in Brooklyn. The radio show, which I produce for Wave Farm, is a way of documenting the concert series and reaching a broader audience. So yes, I suppose you could say I feel a compulsion to engage in the many musical goings-on here in New York City. Far from the post-minimalist composer that you have become, you actually began by pounding drum heads in 9353. From a distance, such a lineage is as about unlikely as it gets: a group of do-it-yourself hooligans seeking succor through volume and distortion stands in stark contrast to a group of learned classical musicians scanning sheet music while taking cues from an authoritative presence. What connection, in your mind, does punk rock have, or can have, with classical music? How has your diverse background influenced your current aesthetic style? Can you speak of how the formalisms of classical music help or hinder your creative processes? More crate digging in Greenpoint, Brooklyn, 2016. Photo credit: Claudia Joseph. Actually, it doesn’t seem that unlikely to me. Post-minimalism and minimalism, have a lot in common with punk rock—rhythm, repetition, melody, drive, to name a few common traits. Frankly speaking, rock music is an essential part of minimalism’s (and therefore post-minimalism’s) DNA. Making the leap to something more “classical,” though I have a hard time identifying with that term, is just a matter of form, structure and orchestration. Well almost. It’s a pretty messy business sorting out all the distinctions between musical genres at this point in history, in our specifically American context, so I tend to err on the side of minimizing the differences. Having said that, I believe having a strong background in punk or any other genre, popular or otherwise, is a help for a classical composer. The only real problems that come up are mental, when one tries to write the music they think they should be writing, rather than the music they actually hear in their head. Some of your work remains unpublished, yet it’s far from second-rate leftovers. Reminiscent of codeine-streaked, Albini-mic’d math-rock, your piece “Particle Accelerator” particularly stands out as an outlier in your oeuvre. Can listeners expect another electric guitar-driven composition along that vein? Do you have any plans to reincorporate traditional rock instruments back into your musical palette? Thanks for listening to Particle Accelerator, it’s an important piece and hasn’t been heard a great deal, mostly for logistical reasons. It’s certainly possible that I will work in some way with electric guitar again, I’ve certainly thought about it, and I still play. Particle Accelerator came about through circumstance—there were a lot of guitarist/composers at Mills College where I was studying at the time, and it was an obvious choice to form a group and write pieces. We ended up with five, and I ended writing Particle Accelerator. So hopefully circumstances will bring me back to electric guitar, soon. Much more than a passive medium, you address time as an active agent throughout Electroacoustic Works. Due to its multi-tracking technique, “Set of Four” engages with a layered verticality, creating a deep ambiance of immersion. In contrast, “Dulcimer Flight” is lean and horizontal, meandering across the horizon of a solo improvisation that requires an attentive stillness to perceive. The album’s iron-clad maverick, “Periodicity Piece”, could function as a clinical exercise in time-keeping: a systematic study of the effects of gradual changes accumulated over a sustained period. How has technology informed your perception of time? And how have your differing compositional processes influenced either your conceptual or experiential relationship with music? Although not altogether impersonal, a certain detachment of self, bordering on selflessness, imbues your work. To what do you attribute this sense of distance: instrumentation, the mediation of the composition process, or perhaps the maturity that comes with aging? Furthermore, your recent work over the last decade clearly pays homage to the minimalist aesthetic. What role has said movement served for you? And which of your contemporaries do you draw influence from these days? Hiking in the Catskill region, upstate New York. Photo credit: Claudia Joseph. Perhaps it’s due to my lifelong immersion in the natural world, or my early life experiences as a child of the 60s and 70s, but for me, music is a transcendent realm, a space beyond the self. Much like a remote wilderness area, I approach it as a respectful guest. My aim as a composer is to immerse myself in that realm and discover what it has to tell me, rather than leave my imprint on it. My pursuit of music is as a seeker and student, not a conqueror or possessor. Though it’s cliché, I aspire to lose myself in music. As far as minimalism goes, I can’t deny that I am a minimalist. It has certainly been the defining aesthetic of our time, and fits me comfortably on me, so I don’t fight it. I have long hoped for some kind of breakthrough beyond minimalism, but that will come when it will, or not. It has served me well as a language, even if it now lacks the shock of the new. There are many contemporaries that inspire and influence me, too many to name, but some figures that have been important to me recently include Michael Pisaro, Ellen Fullman, Craig Shepard, Eve Beglarian, Loren Connors, to name a few. And then there are the elders whose influence is enormous, namely Phill Niblock, Stuart Dempster, Terry Riley and the recently departed Pauline Oliveros. Your social media posts reveal an interest in found décollage—specifically, the technique of the lacerated poster—within the context of the everyday NYC subway commuter. Richard Misiano-Genovese developed the art form further in 1985, creating the technique called excavation collage which involved gluing together layers of printed material, then ripping through the layers to create a new image. How does this art technique reflect your own practice? Do you feel that you have a political, or at least reactionary, side to your art: a creative process starting from something within the world that you’re tearing away from in the pursuit of your own psyche? Is your process one of laborious accretion or of editorial elimination? Dan Joseph in his preferred element: immersed in the nature of the Catskill region. Photo credit: Claudia Joseph. I wasn’t familiar with Richard Misiano-Genovese, so thank you for mentioning him. I’m not sure there is a direct connection between my décollage photographs and my music, at least not a conscious one. However, I did use such a photograph for cover of my recent CD, so there’s obviously some type of connection in my mind. What attracts me to those scenes that I document and frame as though they were actual artworks, is the variety of textures that emerge through both accumulation, as well as natural weathering and decay. Such a scene, when it’s particularly interesting, is the result of many unrelated, often incidental, actions over a lengthy period of time, resulting in a richly inscribed site with many layers of meaning and association. These photographs are as much archeological as they are artistic, and I suppose this can describe some of my music. If any of the pieces on Electroacoustic Works echo the cover art, it would be Periodicity Piece #6. Like the image, it has many layers of signification, and most of the ingredients are ostensibly unrelated or incidental. What any of this says in a political sense, I couldn’t say for sure, though I do believe that all choices are in some way political. Much of your music over the last decade promotes the hammer dulcimer rather prominently as a leading instrument. Emerging in Persia during the 10th century, the hammer dulcimer has since been incorporated by various cultures throughout the world. As an atypical classical instrument, not to mention one without easy analogue in the western tradition, can you speak to its unique appeal and the bond that you share with it? Soundchecking at Experimental Intermedia, New York, 2017. Photo credit: Claudia Joseph. My history with the hammer dulcimer goes back to the 1970s. I came to own my own sometime in the 80s, but it was during my time studying at Mills College in the mid 90s that I formally adopted it as my primary performing instrument. So yes, I do have quite a bond with it, though I don’t consider it an inseparable part of my musical practice. I like to think that the hammer dulcimer chose me, and given my particular skill set, I think it chose well! I’ve always had a strong rhythmic sense, and I grew playing a lot of piano and drums, so the hammer dulcimer, which is essentially half piano and half drums, suits me perfectly. It’s also very portable, which makes it a good gigging instrument, relative to a piano or a drum set. It is also somewhat of an outsider instrument, in most of the places it is found, and that seems appropriate to the kind of music I make with it. Sometimes I find it limiting, and I am not always comfortable being identified as a “hammer dulcimer player” given that I play other instruments and generally have a much broader musical practice, but for the most part, it’s a good relationship. How does that 100-foot yacht sound to you these days? 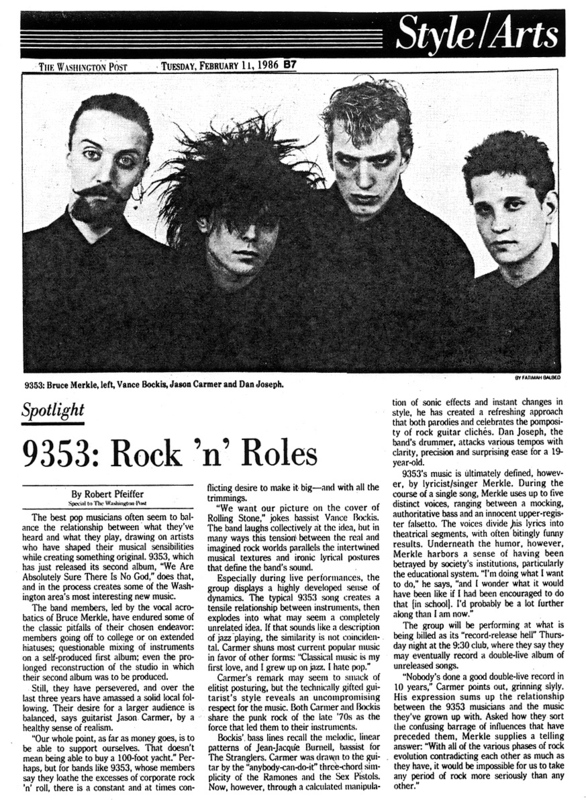 The Washington Post’s Spotlight write-up about your band 9353, a group which was active during the mid-1980’s, describes a collective goal among the group of self-sufficiency, i.e. independence from the whims and wiles of any entity beyond itself. The band was very clear that it was not interested in kneeling to corporate institutions: the goal never included jet-setting after procuring a cover of Rolling Stone. And yet, the virtues of the fringe artist have limits, too. How has it been treading a wayward path past the bazaar of pop culture? What are the challenges, as a composer, of navigating a career in contrast to the reigning status quo? Have you ever felt the pressure to gentrify your music, or to market yourself differently? My teen years in the DC punk scene helped instill in me a strong DIY ethic. That philosophy of self-reliance, of setting up your own shows and making your own community, has been a strong force throughout my entire life. It has been challenging, to be sure, but I’ve always understood that these challenges come with the territory. I would be lying, however, if I denied ever feeling pressure to market myself in a more conventional way, and I have occasionally made efforts in that direction. I guess it ultimately comes down to how badly one wants to succeed in conventional terms, and what one will do to achieve that. I’m happier just focusing on my own internal musical concerns and letting the outside world do what it will. I’m certainly not hiding – I put plenty of music (and words and images) out there, but the notion of a career in the conventional sense has rarely seemed plausible. So I just stay focused on the music. Certainly, being a fringe artist does have limits, but so does being a superstar. I guess it’s kind of a “pick your poison” type of situation. During your 30-year plus career thus far, you have covered vast stylistic terrain. The early punk bands must have served as an example of democracy in action: each member sharing some role in the overall process; the electro-acoustic work, nearly all of which was realized by your own hands, in contrast, must have been quite a solitary affair. Functioning like a synthesis of the first two stages, your chamber compositions are conceived by yourself, yet are dependent upon others for realization. How have these phases, each with their distinct processes, differed for you? What lessons have you learned about life and/or art from each? Dan Joseph in performance with Andrea Williams at Harvestworks, New York, 2017. Photo credit: Claudia Joseph. Leaving the world of rock bands for the more solitary world of the composer was a big change, but since that initial move, each of my different solitary phases have actually seemed similar. Being in bands was certainly more social, in both good and bad ways, while choosing to become a composer was more of an anti-social move. At times it has been too solitary for me, and that has led me to find ways of realizing my music that involves other people in more meaningful ways. My decision to form my own chamber group for example, was an effort to create a community, albeit one in which I was the self-declared leader, but a community nonetheless. In a similar way, my decision to create a live electroacoustic performance vehicle with my hammer dulcimer, rather than just crank out studio work, was designed to get me out in the world and among people with my music. So if there has been any lesson learned, it is that it’s important to find ways to engage with real people in real space as much as possible, while also honoring your own inner artistic needs. The dapper Dan in question sports blue Levi’s on Havemayer Street in Williamsburg, Brooklyn, 2015. Photo credit: Adrian Dinoaca. And now for a slight indulgence, one cannot help noticing that your published press shots over the last three decades all spotlight a rather dapper artist dressed as sharply as his music sounds: sleek and clean, with flawless posture. It is surely a fashion sense worthy of giving William Basinski’s wardrobe the jaundice eye night sweats. If you could wear only one pair of pants for the rest of your life, what brand and style would those perfect trousers be? Lol! I recently got a pair of dark navy blue linen trousers by John Varvatos that I could wear every day. A good pair of Levi’s would probably be a more practical choice…either one would be fine. Everybody needs a good hobby—or two. When not bent over staff paper (or a computer) chasing the muse, how do you spend your free time? Congratulations! You have just discovered a genie’s bottle in the cellar of your Brooklyn flat. You are now granted the wish of birdwatching with any artist of your choice, whether living or dead. Where would you go, what gear would you pack, and who would you bring? I’d take John Cage up into Sequoia National Park, with hiking boots, binoculars, a simple day pack and light rations, maybe some mushrooms, and a camera. A Closer Listen thanks Dan Joseph for his time and congratulates him on his latest album!